Heard of the name? Probably not. I did just a few hours ago, and its quite interesting. the derny leaves the riders to sprint among themselves like wild beasts with about 1.5 laps to go. Some forums I visited talk about how the riders generate in excess of 2000 watts of power! Ofcourse, thats only for a short time. But putting it into a little perspective, that could light 30 normal electric bulbs, in a very environment friendly way! A couple of things I was very impressed by this sport. 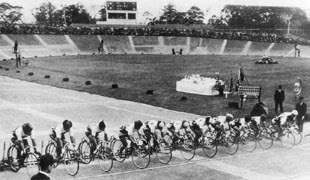 Every equipment and gear used by the riders have to be approved by stringent standards set by the Keirin Association under the Bicycling Federation of Japan (NJS or Nihon Jitensha Shinkokai). Guess what kind of bikes they ride for a gruelling event like this? Plain old Cromoly double butted steel, made by a select few bike makers from Japan ! Thats awesome retro. authority. So no bladed spokes, deep rim wheels, Mavics, Zipps or crappy Cannondale frames. No weight weenies allowed... aaah!! Damn it..
Second. Riders have to go through a formal entrance exam before being selected, and go through an entire schooling process. So your brains gets some work to do too.. The event is a huge sensation for betters. 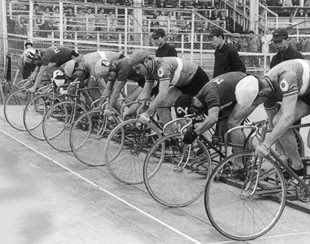 Betting cards are available at Velodromes or designated places in the city. Pretty cool. Like horse racing. 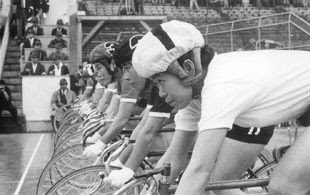 Japanese riders are paid very well and in 2000 the event became an Olympic sport. Its not uncommon for people as old as 60 to take part in a race. The average age is around 35.